The $649 Optoma HD27HDR gives away the big news about itself with its three-digit price and the three-letter acronym in its name: HDR. At this writing it is the only projector on the planet that costs anything like the price, supports HDR10, and can accept 4K input. Connect it to, say, a 4K Blu-ray player, and you can watch a 4K HDR movie with the benefits of HDR, even though the projector will downsample the resolution to its native 1080p. The HD27HDR also has two key advantages over most current 4K projectors. It offers playback of 1080p 3D, which only a few 4K models support so far, and it has a far shorter input lag than any current 4K model. With Enhanced Gaming mode On, the lag is only 16.4 ms in most color modes, making it fast enough for serious gamers. Optoma rates the HD27HDR at 3,400 ANSI lumens. We measured it at a little more than 2,800 lumens—bright enough to fill a 135" diagonal 1.0 gain screen in moderate ambient light. With video optimized settings, we measured it at a little over 900 lumens—bright enough to light up a 140" 1.0-gain screen in the dark or a 100" 1.3-gain screen in moderate ambient light. 10-watt speaker delivers usable sound quality and enough volume to fill a small to mid-size room. Low Lamp Mode. Eco reduces brightness by about 33% compared with Bright mode. There are also two other power settings. Dynamic Black, called simply Dynamic in the projector menu, works like an auto-iris to make dark scenes darker and bright scenes brighter by adjusting the power level based on the contents of the current image. Eco+ is a few percent brighter than Eco. We measured it in Bright color mode at 2,310 lumens. When the image isn't changing however—as when you pause a movie—it slowly dims over time by as much as 70% according to Optoma. As soon as the image changes again, the projector immediately goes back to the brightest Eco+ level. Zoom Lens Light Loss. The 1.1x zoom isn't enough to curtail brightness significantly at the telephoto end of the lens. You can ignore it as a factor when choosing how far to put the projector from the screen. Brightness Uniformity. The measured brightness uniformity for the test unit is 64%. This would be low for a more expensive home theater projector, but it is a touch better than typical for projectors in this price range. A close look at a solid white image shows that it is a little brighter towards the vertical center and towards the bottom, making it dimmest at the upper left and right corners. Those who are particularly concerned with low uniformity may find it unacceptable. However, most people will never notice it, especially with photorealistic images. Video Optimized Lumens (SDR). After adjusting brightness and contrast properly, Film mode with default color settings delivers a close color match to a reference projector. It also offers top tier image quality overall for the price, with suitably dark blacks and excellent contrast, shadow detail, and three-dimensionality for a sub-$700 projector. Film mode also does notably well maintaining the subtle gradations in shading that help make close ups of faces and the like look rounded rather than flat. With the optimized settings, brightness drops slightly, to 918 lumens, making it bright enough to light up a 140" 1.0-gain screen in a dark room or a 100" 1.3-gain screen in a family room at night with moderate ambient light. Eco mode drops the brightness to a touch more than 700 lumens, which is still enough with a 1.3-gain screen for a 135" image in a dark room or an 85" image in moderate ambient light. Color Preset Mode Performance (SDR). Colors for all but one SDR color mode are well within a realistic-looking range with default settings, despite side-by-side comparisons with a reference image showing slight, but varying, levels of blue bias. The exception is Bright mode, which has an obvious green bias for photos, video, and film. However, that's true of the brightest mode in most projectors. Most people will consider the HD27HDR's Bright mode somewhere between tolerable and acceptable for occasional use in, say, a family room in daytime. With default settings for each mode, Vivid delivers the closest color match to a reference projector but loses subtle gradations, which makes close ups of rounded objects like faces, for example, look a little flat instead of three dimensional. Game is similar to Vivid and a bit brighter, but makes rounded objects look even flatter. Cinema and Film modes are also similar to each other, with Cinema being the brighter of the two. However, Cinema also turns some colors—like bright, saturated yellow as seen on a reference projector—into pastel shades. Reference mode offers the lowest brightness, but without delivering the most accurate color, a combination that leaves little reason to use it. With any of these modes, more demanding users will want to adjust at least brightness and contrast, which makes a significant difference for black level, contrast, and sense of three-dimensionality. In some modes it even improves color accuracy, affecting hue and making colors more saturated. For even more accurate color, the HD27HDR's easy-to-use color management system provides settings for hue, saturation, and gain for each primary and secondary color (RGBCYM). We saw no benefit from adjusting Brilliant Color. Changing from the maximum 10 to the 1 setting (off) in Bright mode increased the green bias instead of decreasing it. For those who are willing to pay for calibration, the HD27HDR supports ISF Day and Night modes, which become available only after calibration. SDR Performance with 4K input. When the HD27HDR is connected to a 4K video source, it automatically establishes a connection at 3840x2160. And with 4K material, all the comments above about SDR performance hold true. If you're not viewing 4K material, however, the 4K connection doesn't always provide the best image quality. With a Blu-ray player, for example, playing a 1080p disc—or a DVD—means the player has to upscale the image to 4K, and then the HD27HDR has to downscale it to 1080p to display it. The combination of upscaling and downscaling can degrade the image. The actual effect varies from disc to disc. With one, I saw more noise when connecting at 4K. With another, I saw occasional momentary dead stops in movement, possibly because the projector couldn't keep up with the incoming data. When I set the player to connect only at 1080p, movement was appropriately smooth. With a third disc, colors were noticeably different between 4K and 1080p connections. And with still another I didn't see any differences. The HD27HDR doesn't offer a setting to force a 1080p connection, so you have to set the video source instead. Probably the best approach is to leave the source at 4K unless you're seeing a problem. But if you switch the video source to force a 1080p connection, don't forget to switch it back. HDR Performance with 4K HDR Video. Of course, what makes the HD27HDR notable is that it will let you take advantage of HDR with 4K HDR material. So the really good news is that it handles 4K HDR nicely. To begin with, it automatically switches to HDR color mode—as the only mode available—when it sees an incoming HDR10 video stream, and it switches back to whatever color mode was previously in use when the input changes back to SDR. Unlike most projectors with HDR, the test unit offered only one HDR setting. 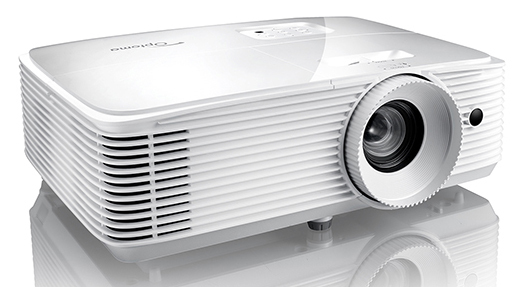 Optoma's 4K-resolution projectors offer four, which provide a range of brightness levels. Optoma says that a firmware upgrade, which should be available by the time you read this, will add the missing three HDR settings to the HD27HDR. Optoma also says that the setting in the test unit is the same as the brightest end of the range. As tested, the one available HDR setting delivered the rich color and excellent shadow detail you would expect from HDR. 3D Performance. The HD27HDR handles 3D better than most projectors. I didn't see any crosstalk in my tests and saw barely a hint of 3D-related motion artifacts. The result was much smoother motion in scenes that tend to show those artifacts than with any other projector I've tested. Like most Optoma models, the 3D is switchable between supporting DLP-Link and Vesa RF glasses. And for those who really love 3D, there's also a 2D to 3D conversion setting. Rainbow artifacts. Like most Optoma projectors, the HD27HDR scores well for rainbow artifacts. I see these artifacts easily, and saw them only rarely with the HD27HDR. With 1080p material, using both 4K and 1080p connections, they were so fleeting that I barely noticed them. With 4K material, they were still rare, but a little more obvious when they showed. If you're unusually sensitive to rainbow artifacts or don't know if you are, it is best to buy from a dealer who allows easy returns so you can test this for yourself. Onboard audio. The HD27HDR's 10-watt mono speaker delivers usable sound, despite a slight bottom-of-the barrel echo effect, along with enough volume to fill a small to mid-size room. It can be helpful for portable use, or for a backyard movie night, but for stereo or better sound quality, you'll need an external sound system. Fan noise. The HD27HDR is rated at 28 dB in full power mode and 26 dB in Eco. In full power mode, you can hear it in quiet moments in a small room, but it is the kind of steady sound that tends to fade into the background. In Eco mode, it is quiet enough that it can easily be hidden by other ambient noise—like a ceiling fan—in a typical family room. Optoma recommends using High Altitude mode at 5,000 feet and above. With High Altitude On, Eco mode is only a little louder than full power mode with High Altitude Off. With full power and High Altitude On, those who are more sensitive to fan noise may want to apply some form of acoustic isolation. Input lag. With Enhanced Gaming Mode On, the HD27HDR's input lag is 16.4 ms in most color modes, 17.1 ms in Vivid and 17.4 ms in Reference. This feature does not work with 4K input. With Enhanced Gaming Mode Off, we measured 33.1 to 34.1 ms with 1080p input, and Optoma says it is the same for 4K. Optoma also says the lag drops to 8 ms in Enhanced Gaming Mode for 120 Hz 1080p input. Although it currently works with PC games only, the Xbox One also supports 120 Hz 1080p, and Xbox games are on the way. Throw Distance. The 1.1x zoom offers enough throw distance range so you can position the projector at approximately the right distance for the screen size, and then adjust the zoom to fine tune the image size. For a 100" 16:9 image, the range is roughly 10.75 to 11.75 feet. You can use the Optoma HD27HDR Projection Calculator to find the throw distance range for the image size you want. Lens offset. The lens offset is designed for placement on a low table or upside down in a ceiling mount. With the test unit right side up on a table, the bottom edge of the image is roughly 12% of the image height higher than the lens centerline. According to Optoma, this can vary, unit to unit, from roughly 10% to 22%. Even without support for HDR and 4K input, the Optoma HD27HDR would be a solid value at $649, with nicely saturated color; excellent contrast, shadow detail, and three-dimensionality; and better-than-typical brightness uniformity for its price class. Adding HDR and the ability to accept 4K input makes it even more of a value, and unique for its price. In its brightest color mode and full power, the HD27HDR can stand up to daylight in a family room, with enough brightness to fill a 135" diagonal 1.0 gain screen in moderate ambient light. With video optimized settings, it can light up a 100" 1.3-gain screen in moderate ambient light, or a 140" 1.0-gain screen in a traditional home theater in a dark room. Gamers will appreciate the 16.4 ms input lag with 1080p input, not to mention the rated 8 ms lag with 120 Hz, 1080p games. Enhanced Gaming mode isn't available for 4K input, but the 33.1 ms lag with Enhanced Gaming mode off is fast enough for all but the most serious gamers. The support for 4K input and HDR—including the 1080p HDR modes on the PS4 and Xbox One S—makes the HD27HDR a compelling choice in its price range. It will let you take advantage HDR's rich color and boost in contrast without the budget you need for a true 4K or pixel-shifting 4K projector. Beyond that, the Full 3D and fast input lag is a major advantage over today's 4K models, most of which have input lags of 50 ms or more. The HD27HDR may well be your preferred choice while you're waiting for 4K projectors to catch up on these other features, or just waiting for them to drop in price. HD26 vs. HD27HDR? I have an HD26 that I have used for a few years, and have been using it with a PS4 Pro. I am looking to upgrade, but I just can’t tell if the 27HDR is going to be that much of a difference... any ideas? Mike, on specs alone the HD27HDR has a better contrast rating, and its ability to play 4K content and make use of the HDR10 mastering on UHD discs and games is a strong plus vs. your now aging HD26. It also has MUCH lower input lag for gaming than either the HD26 or the HD27e (an updated version of the HD27). As well as the ability to play games at 1080p/120Hz. Our reviewer David Stone noted good picture quality in the one HDR mode it offered at the time of our review (the new firmware should allow their usual 4 modes). I suspect image quality is already very good with the HD26, and without direct comparison I can't say what differences you'll see (which is affected by the conditions -- dark room? ambient light? screen gain/type?). But on paper the HD27HDR would seem to be a more modern and advanced projector on several fronts that would benefit your gaming. Thanks for the review. You give a very positive impression of the contrast. I was wondering how the contrast compared to more expensive units such as the Benq W2000+ or Optoma UHD51A. Eric, it's tough to make a comparison between brands, but the specs for the UHD51A, a much more expensive 4K projector, is literally ten times what's cited for the HD27HDR. As it should be: it costs 2 to 3 times the price. What about the 3D on this projector? How bright is it compared to 2D or other projectors? Any issues with 3D performance? How does the contrast and black level performance (with and without Dynamic Black mode) compare to the similarly priced BenQ 2050a? Chris and Nick, I'm inquiring with David about his 3D experience with the projector. As for a contrast comparison with the BenQ 2050a, we really can't comment on it short of a direct comparison. There is no doubt though that the HD27HDR is a much brighter projector (just look at our measurements of each in the individual reviews). That can sometimes be a plus or a minus depending on your viewing conditions and application -- a much brighter projector may sacrifice some black level/contrast in a dark room for the benefit of more punch. On the other hand, if you view in high or modest ambient light the extra lumens are a big plus and you may not notice differences in contrast. The addition of HDR in the HD27HDR adds something to the equation as well; although it doesn't really boost the brightest highlights or darken the deepest black, it's massaging of the gamma curve has a visual effect on apparent dynamic range. That ability to view HDR content is something the BenQ 2050a cannot boast. As for input lag time, both projectors are rated at a very low 16 ms.
David has added comments to the story to address the 3D performance that were inadvertently dropped from our initial draft. The Optoma HD27HDR actually performed quite well with 3D, and specifically rendered motion very well in 3D mode. You can see his comments just below the paragraph describing "Rainbow Artifacts." Would you recommend this model over the Optoma HD143x? The HD27HDR is currently $200 more expensive. is it worth it over the HD143x? Alexander, it strikes me that the much higher contrast ratio on the HD27HDR and the ability to feed it 4K HDR content and enjoy some benefits of HDR makes it well worth the premium in this case. Thanks Rob. I am still unsure of the meaning of "4k compatible". Does it mean that I can view 4k videos but only in 1080p? Will there be a difference in quality? Correct! This projector can recognize and accept a 4K input signal and will downscale it to 1080p to match the resolution of its DLP imager. If that 4K signal is encoded for HDR, it'll recognize that and activate its HDR viewing mode for enhanced contrast. This is a previously unseen feature on 1080p projectors, but I suspect we'll see it appearing elsewhere as time goes on. Regarding image quality, and even putting aside the HDR compliance and the benefits of that, there is another potential benefit by being able to start with 4K content even though you're only viewing at 1080p. When content is truly captured and mastered at 4K (either by a scan of a film negative or with a 4K video camera), some of the additional detail captured vs 1080p is retained even when the content is downscaled. Readers might recall that Sony was specifically promoting 1080p Blu-rays a while back that were mastered at 4K; the idea was that there was more detail in them than if the same movie was mastered at 1080p and just plunked on the disk. I actually had the pleasure once of visiting Sony Picture's mastering facility in Hollywood, back when they were just launching their first 4K home theater projector, and had the benefits of a 4K or higher capture clearly demonstrated for me on 1080p studio monitors. Wow, thank you for all the info Rob, it has really helped! How does it compare with LG PF1500W? Suggest you do a comparison with our Feature Search function on the homepage. The Optoma is considerably brighter, is cheaper, and handles 4K HDR content when the LG does not. Maybe this is an impossible question to answer due to the differences of technologies but figured I'd attempt to ask. What TV on the market would or could this projector be compared to? I know we aren't talking about OLED quality blacks. But colorwise and black level wise how does this compare to a decent quality 4K TV? There are possibilities to see this projector for sale in Italy? Thanks for a great review! I purchased the HD27HDR and the image quality is impressive for this price range, but the high-pitched fan (or color wheel) noise that whirls up when it turns on then stays constant like tinnitus is really annoying. Is this a 'known' issue on Optoma projectors? This is my first Optoma DLP. Optoma does business internationally and I gather there is a European equivalent. I'll make an inquiry. This was not an issue in our sample according to our reviewer David Stone, but there was some mention of it on the enthusiast bulletin boards among some users. 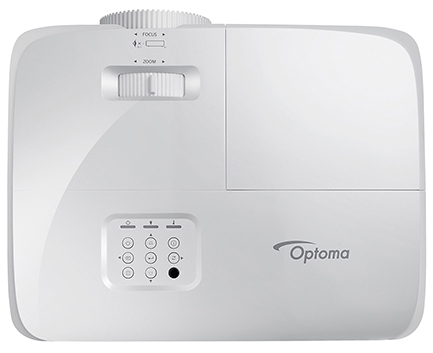 It has not been a common issue among Optoma projectors. If you only have Blu-ray DVDs to play would this projector be overkill as the HDR feature is not being used ? Would I be better with a lesser model such as Optoma HD141X, original HD27 or the BenQ HT2050a ? Hello, have you had a chance to review the BenQ 2050A? If yes, between that one and the Optoma HD27HDR, which one would you recommend? Angel, our review of the 2050A can be found with a simple search on our site. Without doing a direct comparison it's hard to know where these stand. The Optoma derives some benefit from HDR content that the BenQ cannot, but the BenQ reviewed well among 1080p projectors in this price class. I'd be hesitant to make any judgements about black-levels and contrast among these two because of that difference. A careful read of both reviews should give you a better sense of strengths and weaknesses beyond this key point. Does anyone know where or when will this projector go on sale in Europe? I can't find even one store that offers it. Even Optoma Europe themselves. I picked an HD27HDR to replace an older HD26 that I had been using. The one that I received does not have any issues with color wheel noise, but it also only has a single HDR setting unlike what was said in the comments above. Not sure how to get new firmware update as it is not listed on the Optoma website. Brightness is better than the HD26, but that might have something to do with the number of hours I have on the lamp. That said, the HD27HDR is an improvement over the HD26 (which is very similar to the HD14x) in all ways. In 1080p SDR mode, the colors are deeper, the contrast is better, and I don’t get the pumping that I was seeing with the HD26. There is still a bit of banding evident, but much less than before. Also, rainbow effect is much less - I used to notice it once in a while on the HD26, but have not picked it up once on the new projector. I found the ‘gray’ screen setting useful to help with making the picture optimized for my 100” ALR screen. I have significant ambient light in my living room with off access open windows pretty much all day. Night time viewing allows the color/contrast to really shine, and I am tempted to black out everything just to get that performance all the time. I have had minimal chance to do much viewing in HDR. I have played a few games through my PS4 pro on it. Lag is unnoticeable, and HDR mode makes the colors/contrast even better in AC Odyssey. Even For Honor looks great in 4K SDR mode (doesn’t support HDR) as compared to 1080p. The projector automatically switches to HDR mode when detected. In my case, that is when a game starts up. There is about a 10 second delay as it resyncs, but other than that, it works perfectly. I did notice that I had some sync issues with a couple of my 4K certified 35’ HDMI cables, but switched to a different brand (40’) and it works just fine. The ‘bad’ cables work just fine in 1080p mode, but for some reason, won’t sync (BSOD) when switching to 4k (with or without HDR). I have visited various stores in the area, and, in my opinion, you have to triple the price before you start getting a projector with better performance. Hope that this mini-review is helpful. Thanks for sharing your eyes-on experience, Michael. Very helpful to me and other readers. Thank you Rob. There are so many models! How does the HD29H compare to the HD27HDR? And also I still can't find the 27HDR, but the 29 seems to start getting available. I'm mainly interested in buying it from Amazon. My understandings is that the HD29H is the same projector as the HD27HDR, just a different model number for the Euro market. is it true that there is NO keystone korrection? what if i want to mount that on the ceilling? If a projector has no keystone correction you must mount it in a location that avoids having to tilt the projector up or down. In a ceiling mount, you'll have the projector facing directly toward the wall on which the screen is mounted and use the vertical lens shift available in the projector to get the image framed up on the screen. If the combination of the native vertical offset (which pushes the image down to some degree with an inverted ceiling mount) plus the available shift still places the image too high, you would have to use a pole on the mount to get the projector a bit further off the ceiling. Otherwise, your only option would be to tilt the projector down, which would cause keystone distortion that you would have no mechanism to adjust out. There is Vertical Keystone adjustment, just not "Automatic" so it must be set manually in the set up menu. There is no horizontal adjustment, so you need to be sure the projector is centered left/right to the screen. I am a big fan of projector central, buying 3 projectors based on these review. I am trying to decide between an Optoma HD143x or the HD27hdr. Gaming got, movies the room is 22x21 and it total blackout. I am after the biggest screen I can get. What would you recommend. The game system is Xbox one and the media driver will be a fire stick. Please help me decide.